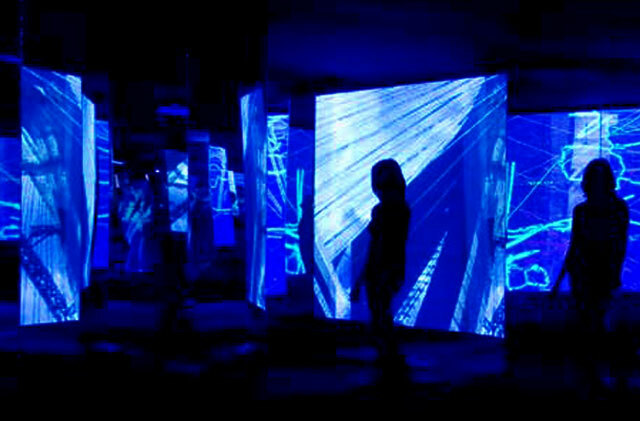 The first implantation of Territories Complexity was in 2007, as a site-specific installation at SESC Paulista Art Gallery. Paulista Avenue is 2.8 Km long and has a conglomeration of skyscrapers, which hold public and private administrations responsible for 46% of the Brazilian GDP. Paulista Ave. has 22 heliports, 40 telecommunication antennas, flux of 1.5 million people, 100 thousand vehicles and 100 helicopter takeoffs per day. Based on this information, this economical area was mapped using different capturing devices and stored in an audiovisual database. The space was designed to be an asymmetric kaleidoscopic formed by two projections and mirrored panels, creating a polyphonic multiplicity, discontinued and immanent, which represents complex urban situations. The space dynamically combines two different ways of interacting: local and remote. Locally, two ultra-sound sensors regulate the scales of GPS information, reading the distance between the interactor and the interface. If the interactor is close to the interface, the information level revealed is more abstract, as the pure GPS data; if the interactor is further to the interface, it is possible to see the geographic coordinates of Paulista Avenue. 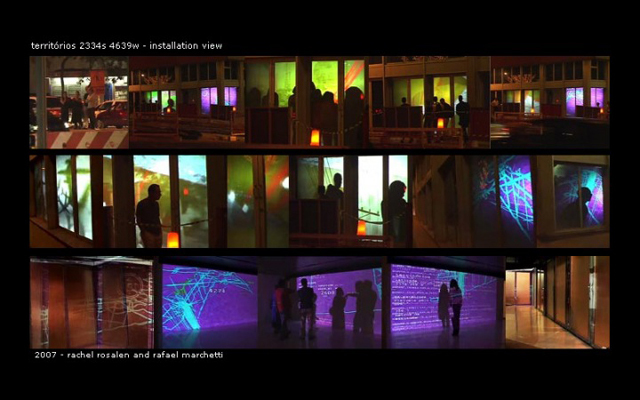 The remote interaction consists of getting the Paulista Avenue’s sound in real time by using the Internet, which influences the rhythm of the projected landscape in the space. For the exhibition at Espacio Fundación Telefónica in Buenos Aires, the implementation of the microphone in São Paulo was fruit of a collaboration between SESC Avenida Paulista and the artists. For the exhibition at Galeria Cândido Portinar at the Embassy of Brazil in Rome, the implementation of the microphone in São Paulo was possible thanks to a collaboration between Governo do Estado de São Paulo, Secretaria da Cultura, Casa das Rosas and the artists.